Its time for Back to School Pictures Over Stillwater Drones for Non-Dummies. Pictures Over Stillwater in partnership with Stillwater Area Public Schools Community Education announces a new spring course “Drones for Non-Dummies”. Drones for Non-Dummies is new community education course will be taught by FAA Part 107 certified UAS (e.g. drone pilot), MNDoT UAV (drone) and Aerial Photography licensed drone pilot Greg Schulz (me) of Pictures Over Stillwater. Small Unmanned Aerial Vehicles (UAV), Unmanned Aerial Systems (UAS) “drones” are growing in popularity and capabilities. Drones are used by recreational hobbyists, commercial, non-profit, government, and public safety agencies. In this class, you will learn about drone safety, rules of the road and air, registration, certification, license, insurance, drone types, as well as, when, how and where you can fly. Other topics include practical tips, techniques, and trends. You do not have to own a drone to attend as we will look at various drone options in case you are thinking of getting one. If you do not have a drone and want to explore some options, or, look at upgrading what you have, check out our resources page that includes items we use and endorse. Students ages 12-17 are welcome to attend with an adult. The course will be offered twice this spring. The first offering (e.g. 4564-1) in April will be on the 17th and 24th. The second offering (e.g. 4564-2) will be in May on the 13th and 20th. Note that each course spans two evenings from 6:30 to 8:30 for a total of four hours. Oscar, DJI Phantom IV Plus with 4K video resolution and 60 fps rate along with up to 20 mp image size. The courses will be held at Stillwater Area High School PAC G113 (Health). Visit our Gallery page to view additional related content (still images and video). Also visit and like (thanks in advance) our Instagram.com/PicturesOverStillwater page, as well as our Facebook.com/PicturesOverStillwater page (includes interactive 360 panoramic views). Visit our virtual image store powered by SmugMug where you can shop for photos and videos including physical prints as well as downloads in various sizes. We also have a virtual store at Fine Art America (the other FAA) where you can shop for canvas and other print items. Don’t be a dummy, learn to fly drones safely, see you at Back to School Pictures Over Stillwater Drones for Non-Dummies. It is 2019 Spring Flood season in the upper midwest including Minneapolis St. Paul twin cities metro area along with western Wisconsin, eastern Dakotas and elsewhere. In the Minneapolis St. Paul twin cities metro area, there are three major rivers all of which flow into the mighty Mississippi river, not to mention numerous smaller rivers, streams, creeks as well as other runoff. For the 2019 Spring Flood season, in the Twin Cities metro, western Wisconsin, western as well as southern Minnesota as well as eastern Dakotas, February record-setting snow fall are now melting. Besides record February snow fall, there was a lack of snow cover in the Twin Cities metro and surrounding area in early January to protect against the extreme cold, thus driving frost deeper into the ground. With frost being four plus feet deep, snowmelt that would normally start to seep into the ground is having to run off elsewhere which results into the area lakes, ponds, creeks, streams, small rivers and ultimately the Mississippi and other large rivers. Click here to view updated NOAA weekly probability forecast. Note that we are FAA Part 107 certified (e.g. commercial drone operator) and MNDoT Aeronautics & Aviation Drone as well as Aerial Photography licensed, and insured, meaning our images as well footage can be used safely for various commercial purposes including by news or other organizations. Now is the time to be getting prepared for 2019 spring flood season, watch for more images and content to be added soon. Check out our post about Winter Motorcycle Ice Racing here, Stillwater Lights here, Dynamic Fall Cloud Inversion Weather (Dragon Breath) on St. Croix River here, and 10th Annual Withrow Tractor and Classic Car show here, The Outing Lodge at Pine Point here. View additional videos and images in our Gallery page here. Visit, follow and like us on Social Media sites shown below including Facebook, Instagram, Linkedin, Twitter and YouTube. Recently I had the opportunity to visit The Outing Lodge At Pine Point Stillwater Minnesota located at 11661 Myeron Rd N, Stillwater MN 55082. Living nearby, having heard about, as well as driving around the area, I had not actually seen in person the outing lodge at pine point located northwest of Stillwater Minnesota. Given the opportunity to visit the outing lodge at pine point along with some nice winter weather, the following are some views of the area, buildings and grounds. Adjacent to the gateway trail (PDF Map) (bicycle and pedestrian) in Stillwater Township, the outing lodge at pine point is also bordered by pine point park. Just a few miles away to the east flows the St. Croix River, to the southeast Downtown Stillwater with its historic liftbridge, to the northeast Square Lake and Marine on St. Croix. Also just a few miles away to the northwest are Withrow and Hugo (home of the Withrow Tractor and Classic Car Show), and to the southeast Grant as well as adjacent gateway trail. What surprised me about the outing lodge at pine point was the vastness of the property, number, and size of structures along with their history. For those not familiar with the area, there is a lot of wide open spaces, active farms, and ranches with horses, lakes which add to the outing destination factor. There are also many trails on the grounds for walking in summer or snowshoe in the winter months, not to mention, adjacent gateway trail. The outing lodge at pine point is a Bed & Breakfast (B&B) with nice rooms, a large lobby great room, dining areas as well as plenty of room for events from weddings to seminars, meetings among others. In addition to being a B&B and hosting weddings as well as other events, the outing lodge at pine point also hosts summer and winter events including snowshoe among others. Thanks to the folks at the outing lodge at pine point Stillwater Minnesota for the tour inside the facility in addition to being able to capture some images from above. Learn more at The Outing Lodge at Pine Point website here, visit them at 11661 Myeron Rd N, Stillwater MN 55082, or call (651) 439-9747, tell them Greg from Pictures Over Stillwater sent you. Check out our post about Winter Motorcycle Ice Racing here, Stillwater Lights here, Dynamic Fall Cloud Inversion Weather (Dragon Breath) on St. Croix River here, and 10th Annual Withrow Tractor and Classic Car show here, along with our 2018 In Review Aerial Views here. Recently Tom Becchetti (@tbecchetti) told me about Winter Motorcycle Ice Racing on Lake Martha in Chisago City Minnesota. I had heard of, seen photos and videos of Motorcycles racing on frozen lakes or rivers in the past, however, had not seen in person. Despite being a cold northwesterly wind with light snow, Tom and me decided to meet up at Lake Martha to do some sUAS / sUAV e.g. Drone flying and capture some images of Winter Motorcycle Ice Racing. Winter Motorcycle Ice Racing Lake Martha Chisago City. For those not familiar, Chisago City is in Chisago County which is about half hour to 45 minutes north of Stillwater, or, about an hour (or less) to the northeast of downtown Minneapolis St. Paul areas, and just a few miles west of Lindstrom Minnesota. There are many lakes in the area which is also close to the St. Croix River valley to the east. Lake Martha is on the western edge of Chisago City north of Highway 8 and adjacent to The Northern Tavern, or, across the highway to the northwest of Chisago lake among others. The following are various sights, sounds, images and video from watching Winter Motorcycle Ice Racing on Lake Martha Chisago City. Watch for more Winter Motorcycle Ice Racing content to be added soon. In the meantime, check out our page here showing the new for 2018 Stillwater Lights experience located in downtown Stillwater MN. For those who are into cars, tractors, motors and motorcycles, checkout our coverage of the 10th Annual Withrow Tractor and Classic Car show here, along with our 2018 In Review Aerial Views here. There is a new attraction in Downtown Stillwater as of December 21, 2018 (besides the Winter Solstice) and that is Stillwater Lights aka “The Tunnel of Lights”. The following are various images and video views starting with material arriving at Lowell Park, site of the Stillwater Lights along with a trip through the completed experience. Stillwater Lights is an experience that you walk through (and its free open to the public) an open-air tunnel of lights. At the base, it is about 24 feet wide and around 18 feet tall (give or take a foot or two). There are entrances at the ends, as well as along the sides with lit stars to mark the locations. Since a picture or video is worth a thousand words, have a look at the attached to get the rest of the story and experience. Hours are daily from 4 to 10 PM and slated to be open until March. Check out our post about Winter Motorcycle Ice Racing here, Dynamic Fall Cloud Inversion Weather (Dragon Breath) on St. Croix River here, and 10th Annual Withrow Tractor and Classic Car show here, along with our 2018 In Review Aerial Views here. Dynamic Fall Weather St. Croix River Inversion Fog Dragon Breath. One of the things I enjoy about living in the Minneapolis St. Paul metropolitan area is the changing weather and seasons, if you don’t like it, wait and will change. 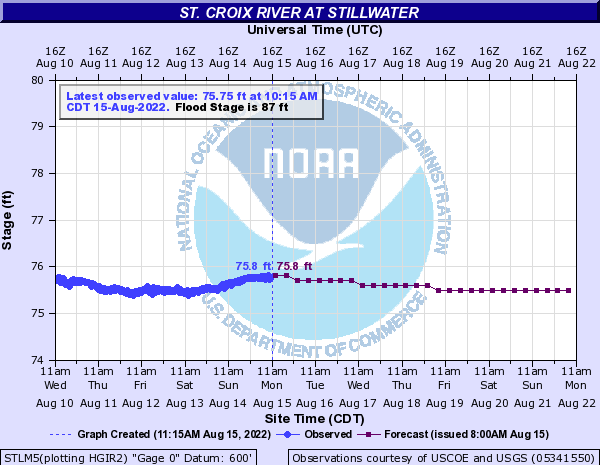 That has been the scenario past week or so here the Stillwater St. Croix River valley eastern Minnesota and Western Wisconsin areas. So far in the past week, we have seen highs near 70 lows of freezing frost, clear and windy to wall clouds and tornadoes. We have also seen partly cloudy with calm windows high humidity between rains including inversion fog layers on the St. Croix River. Some drone-based aerial views above and around Stillwater as well as St. Croix River valley over the past week. These include visits to Stillwater Fire Department open house, Art Fair, fall colors, St. Croix Sailing School High School Regatta in Hudson, new St. Croix Crossing bridge and much more. From a sUAS or drone flying perspective, strong winds are a challenge and even more so are rain. However, in between those conditions, there have been some great opportunities to go upstairs and gets some different and unique perspective views that past week. For example, check out the following video that I captured the other evening of inversion fog layer over St. Croix River valley shortly before evening severe storms arrived. Dynamic fall weather resulted in Layer of Inversion Fog (Dragon Breath) Over St. Croix River flows south under Arcola Soo Line High Bridge towards Stillwater MN. Following are some photos in various Pictures Over Stillwater photo galleries from the past week (along with others). Keep the weather in mind, head in the clouds and feet on the ground meaning watch the sky along with weather, while you are safe on the ground. Weather can change quickly, so be ready, plan ahead, watch forecasts and be prepared. When you contact any airports or air traffic control for the areas you will be flying (e.g. for those in Stillwater area, the downtown riverfront is controlled airspace), ask for conditions at their location to compare with your own local. If you are flying an sUAS or drone, keep your eyes on the aircraft, if using first-person view (FPV) goggles have one or more visual observers (VO). Pay attention to surface winds along with those aloft, look around where you are going to be flying. Look at flag poles which way they are pointing, the direction of clouds, smoke from chimneys and other indicators. Also, note that winds can vary at the surface as well as a few feet to hundreds of feet up in the air. Another consideration is how the windows can be more turbulent around buildings, bluffs, hills and other structures, something to keep in mind. Note that while your drone may have automation and is fine once up in the air (watch out for fly-away during high winds), the landing may be a challenge. Likewise, not if, rather what happens when your software based automation AI enabled drone stops working and you need to land manually? How will you avoid a crash? The answer is being prepared. Something I have noticed is that changing weather, the birds can be an indicator of when to land or get out-of-the-way if you are flying FPV mode with no VO, how will you see the birds behind or on your sides? Likewise, keep the aircraft in visual line of sight (e.g. don’t fly beyond where you can see it) so that you can recall quickly before developing weather has an impact. Also if you are using filters, adjust accordingly for example if cloudy try an ND4. Have fun, however, be prepared, be safe. Check out our post about Winter Motorcycle Ice Racing here, Stillwater Lights here, and 10th Annual Withrow Tractor and Classic Car show here, along with our 2018 In Review Aerial Views here. The 2018 Withrow Car Tractor Show was recently held being the 10th annual event. Pictures Over Stillwater was present capturing video and still aerial photography along with other sights as well as sounds of the vent. Withrow Car Tractor Show was co-hosted by Sals Angus Grill and Withrow Ballroom Event Center is a great event located between Stillwater to the east, Grant to the south and Hugo to the west. As a fundraising event, the Withrow Car Tractor Show benefits the Minnesota Military Family Foundation as well as Wishes & More organizations. If you are not familiar with the event, view the following images and video highlights that included monster truck rides, classic trucks, classic cars, racing cars, classic boat motors, classic trucks, a tractor parade and much more. For those who attended the vent, revisit the sights and sounds of the 2018 Withrow Car Tractor Show. Before and during drone based aerial videos of 2018 (10th annual) Withrow Car and Tractor Show. The event co-located at the Withrow Ballroom Event Center and Sals Angus Grill hosted about 450 classic cars and tractors (plus a few trucks, race cars, boat motors). This event benefits the Minnesota Military Family Foundation and Wishes & More. Views from 2018 (10th annual) Withrow Car & Tractor Show including parade between Withrow Ballroom & Event Center and Sals Angus Grill. This event is a fundraiser for the Minnesota Military Family Foundation and the Wishes & More organization. Pictures Over Stillwater is a proud participant for this year event providing aerial photography and other views. Check out our post about Winter Motorcycle Ice Racing here, Stillwater Lights here, Dynamic Fall Cloud Inversion Weather (Dragon Breath) on St. Croix River here, The Outing Lodge at Pine Point here, along with our 2018 In Review Aerial Views here. Pictures and Videos Over Stillwater brings unique perspective vantage point views of over and around Stillwater MN, the scenic St. Croix River Valley along with adjacent areas. Pictures over Stillwater provides different perspectives and unique drone aerial photography and video views of the upper midwest, greater Minnesota, Wisconsin, Minneapolis St. Paul twin cities metro area to the St. Croix River Valley among other places.